Right away, Strike Suit Infinity formed a strong first impression for me as both enjoyable and repetitive. This is a game that came into existence on a shoestring budget, but the final product still manages to come off as polished and fun, in spite of its own simplicity. Sometimes, terrible games can have terrific replay value – lots of variety, but no enjoyment – but this game seems to fall into the opposite category: pretty fun, but always the same (and inordinately difficult to boot). [singlepic id=11915 w=320 h=240 float=left]I dove right in, wanting to try my luck at actual combat rather than waste time on the tutorial. At first, it’s rather challenging to deal with the lack of reference points inherent in a zero-gravity environment, but it brought back some pleasant memories of one of my favorite books as a kid, Ender’s Game. Mastering the zero-gravity dynamic plays a crucial role in learning how to catch up to your targets, which adds a nice layer of complexity to a game that seems pretty straightforward at first blush. Once you wrap your head around the unique piloting demands, it becomes much easier to trace your foes and use the environment to your advantage. [singlepic id=11914 w=320 h=240 float=right]Comprised of a basic arcade mode, Strike Suit Infinity challenges you to survive as long as possible while making your way through increasingly difficult rounds. As you play, you’ll rack up credits you can use to trick out your fighter, which adds some variety to the combat. The pursuit of that ever-tantalizing “new high score” is a great incentive to keep trying your luck and going back for more, but the repetitive nature of the sim caused me to lose interest a bit more quickly than I’d hoped. The emphasis on global competition whet my appetite in the beginning, but a lack of variety in the overall gameplay eventually outweighed my desire to see how fast I could climb the leaderboard. The controls are about as simple as can be, utilizing WASD and left shift for barrel rolls and thrusters, while the mouse acts as the yoke for steering and aiming (along with the triggers for your arsenal). As almost any experienced gamer can attest, the best arcade games rely on straightforward controls, and Strike Suit Infinity manages to pull that off just fine. Simplicity is just half the battle, though – they need to be intuitive and responsive, and I thought the control scheme performed admirably when held to those standards as well. 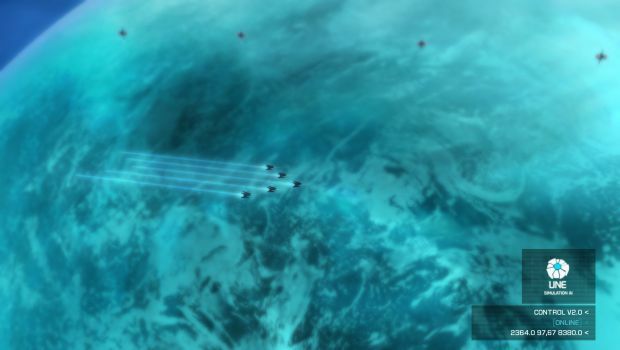 It can be rather tricky to get the hang of chasing an enemy fighter while unleashing accurate shots – those suckers can be tough to hit sometimes – but it’s all part of the challenge, which made me want to keep playing to improve my marksmanship. [singlepic id=11913 w=320 h=240 float=left]One bright spot in the overall complexion lay in the soundtrack, which was a futuristic synth-pop song that featured cool female vocals and a catchy hook. This made for an enjoyable atmosphere, and helped me lose myself in the game more often than not. A good soundtrack can do that – even if the mechanics may not be all that stimulating, the music that you’re listening can make all the difference in terms of immersing you in the world that the developers envisioned. In terms of the visual design, I found the deep-space environment to be eerily beautiful and eye-catching, and it provided a great backdrop to the dizzying pursuit of enemy fighters. The developers managed to capture the staggering size of nearby planets and asteroids, along with the overall scope of an actual dogfight in space – tiny ships float in the distance, while a huge enemy frigate materializes out of a rippling hyperspace bubble. The “Strike Suit” of the game’s title is a neat-looking bot that resembles a soldier in a mech-suit with wings, flying headfirst into battle. In short, it looked great, and I thoroughly enjoyed the ability to customize and upgrade my vehicle, giving my little trooper every advantage to help him survive the endless waves of enemies. [singlepic id=11910 w=320 h=240 float=right]To that end, Strike Suit Infinity comes with the charm and labor-of-love status that gamers have come to look forward to with indie titles. They don’t have the manpower or cash that big developers rely on, but companies like Born Ready Games show that they can still produce a fun, bug-free space sim that I found myself gravitating towards on my Steam panel more often than not. As mentioned, the main drawback of the game lies in its repetitive nature – the environments are almost all the same, as are the enemies – but it’s difficult to fault a game for that when the lack of complex objectives was one of the main goals of the release. I wouldn’t exactly call it mindless, but tactics and advanced strategies don’t come into play much, either. The bottom line, as you might expect, is that this is a visually rich combat simulator that brings a lot of arcade-style pleasure to the table, and it succeeds in strolling a fine line between repetitive and addictive – something that many similar titles aim for and miss. You might lose interest after no more than a few hours or days, but until that does happen, you’ll probably have a pretty good time.